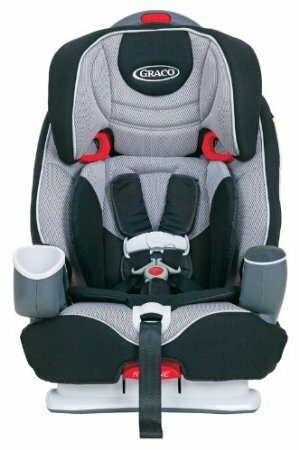 Expert guide to buying a safe child or infant car seat, including details about which types of car seats are appropriate for children of varying ages. Throughout the United States, car seats are required by law for small children who are passengers in cars. The seats themselves must meet federal safety standards in effect since 1981. Look for labels indicating that they have been “Dynamically Crash Tested” and are certified for use in both cars and aircraft. Before making your purchase, be sure that your child will fit the seat, that the seat fits your car, and that you understand how to install it. Child car seat adapts to a growing child; it’s suitable for kids from 20 to 100 pounds. You can buy child or infant car seats online or at retailers of children’s goods. Car seats come in three sizes and will only be effective if the correct size is used. Infant car seats carry babies home from the hospital and, depending on the model, up to 22 to 35 pounds. Safety requires that seats made only for infants be firmly strapped so that they face the rear of the car. Recommendations issued by the NHTSA in 2011 urge parents to keep a child in a rear-facing car seat up to 3 years of age. Convertible and 3-in-1 car seats have higher height and weight limits if your child outgrows the infant car seat before the age of 3. Toddler and school-age children car seats are designed for children from about 20 to 50 pounds, or roughly 4 to 7 years in age. These are strapped to face forward and have a harness closure. Car booster seats protect children between the ages of 8 and 12, until they have reached 4 feet, 9 inches in height.. Some models provide their own harnesses or shields against impact. The most effective booster seats have fully adjustable shields. Otherwise, use the car’s seat belt, which should cross the boosted child’s shoulder at about the position it would cross an adult’s. Car seats (child-restraining devices, or CRDS) are regulated by the National Highway Traffic Safety Administration. All car seats manufactured after January 1, 1981, must meet government standards. In addition, the NHTSA along with the American Academy of Pediatrics issued updated recommendations in 2011 governing the use of car seats for children. The NHTSA recommends that children always ride in the back seat of a car up to the age of 13. If the cost of a brand-new quality car seat is prohibitive, some communities sponsor programs that loan or rent car seats at a low fee. Call the pediatric department of a local hospital to find such a program near you. Beware of using a used car seat—it may be obsolete and unsafe. Look for the label on its back that gives the date of manufacture so you can check that it was made after federal safety standards were implemented and that it is up to current standards. Make sure that it is in good condition with no missing parts. Make sure, too, that the car seat comes with the original manufacturer’s instructions or you may not be able to install or use it correctly. If a used or borrowed car seat has been involved in a car accident, do not consider it safe. TIP: Test that all metal parts of a seat belt are cool before you place your child in it. Kids look to their parents as role models. To give your young ones an example of safety, always buckle up your seat belt when in a moving car. Babies and small children need both seat belts and car seats to protect them. And older children need to practice good seat belt habits. Children will be safest in the back seat. If it has only lap belts, the belt should fit snugly across the hips (not at lap level). In general, for passengers of all ages, a lap-shoulder combination seat belt provides much better protection than a lap-only belt. Make sure the shoulder strap fits snugly across the shoulder; on a child, if it crosses the face and neck, tuck it behind the child’s back. Never hook it under an arm. While in a moving car, it is never safe to hold a baby or small child on your lap. More obviously dangerous is to let children of any age ride in the open bed of a pickup truck, in the back of a camper or motor home, or the cargo area of a station wagon or van.